Smith conducting a clinic at a music store in 1978, shortly before he retired as a performer. Smith in ’78: Lawrence Grinnell. 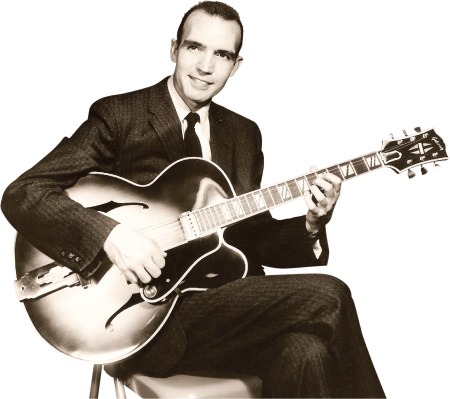 Jazz guitarist Johnny Smith died at his home June 11, 2013, two weeks shy of his 91st birthday. Arguably the most respected and revered guitarist of the modern era (1950 to present), Smith was sincerely humble and reserved about his extraordinary talent. Smith was born in Birmingham, Alabama, in 1922. The Great Depression forced his family to Portland, Maine, and, by age 13 he had struck a deal with a local pawnshop whereby he kept the store’s guitars in tune as he used them to teach himself to play. Soon, he was giving lessons and playing hillbilly music with Uncle Lem and the Mountain Boys, a group that traveled the state and paid the youngster $4 per night. He heard his first Django Reinhardt record as a pre-teen and saved his nickels so he could buy every Django 78-rpm recording that was released. His folks had a Victrola which afforded only three or four plays before it wore out a disc. Still, that was enough for the talented youngster to memorize Django’s licks. Soon, he was in the Army Air Corps in hopes of realizing his dream of becoming a pilot. But because of a vision flaw in his left eye, he was given the choice of becoming a flight mechanic or joining the marching band. He opted for the band and was given a cornet and an instruction book. His intrinsic talent and dedication (hours of practice in the latrine) saw him conquer the horn and the Arban method in a couple of weeks. Smith also used his time in the service to develop his guitar skills. “From having to read on the trumpet, I learned what the notes were and was able to transfer them to the guitar,” he said. “I’d read everything from Kreutzer violin books, second and third trumpet books, and whatever I could find. “Before the war, I met Charlie Christian when he came to Portland, and later I heard that great record he made with Benny [Goodman], “Airmail Special.” It was such an inspiration. Smith with his signature model Gibson. Johnny Smith courtesy of Mel Bay Publications. Smith’s involvement in guitar construction began in 1946, shortly after his arrival in New York. He entered an arrangement with Epiphone to use its Emperor model as his regular instrument, and designed the Emperor Concert – a purely acoustic instrument easily identified by its trapezoidal sound hole. Smith widened the parallel bracing and had the top carved to reduce thickness around the sound hole. The guitar was intended for production, but his own was the only one completed. Smith had mixed feelings about his first attempts at guitar design. The features he helped devise improved the instrument’s ability to project melodies, but he found the size of its body cumbersome. In 1950, he began a legendary relationship with John D’Angelico, who at the time produced the New Yorker and Excel. Smith’s first D’Angelico was an Excel-sized instrument with the more-ornate features of the New Yorker, and a floating DeArmond pickup. Unfortunately, it was lost in a house fire the following year, after which he used a ’30s D’Angelico lent to him by John Collins. The guitar had a notably wider fingerboard, which Smith initially found unwieldy but then came to appreciate. In 1955, Smith took delivery of his third D’Angelico, commissioned to unique specs including a 20-fret fingerboard on a shorter 25″ scale neck that continued under the length of the fingerboard into the cross bracing. The shorter scale length facilitated his trademark stretch chords without loss of tone, while the extended neck and cross-bracing resulted in a better balance of tone and volume. Many of New York’s jazz guitarists were so enamored of this guitar that they placed orders for identical instruments. The following year, Smith began an endorsement deal with Guild, which resulted in the Johnny Smith Award. Most of its design features appeared on his ’55 D’Angelico. The scale-length, however, was 1/4″ shorter, as he continued to search for an equilibrium that would accommodate his stretches without significant loss of tone. Famously, Smith disagreed with the factory foreman regarding the carving process, though years later he graciously admitted he had been wrong and that the Guild was a fine instrument. A Guild Johnny Smith model. Smith never played one, but the company used the design on its Artist Award. In 1961, Gibson began producing its own Johnny Smith model, which manifested the results of Smith’s years of research and was, in effect, the production version of the ’55 D’Angelico with its specs, including a return to the 25″ scale length and a nut width of 1 3/4″. The cross-bracing was a return to old methods for Gibson, but it was the first guitar in the company’s line to use the PU-120 floating pickup, which permitted the instrument’s top to vibrate unhindered. Luthier Bob Benedetto has no reservations about Smith’s influence on his own development through the Gibson. By 1989, Smith had become frustrated with certain methods at Gibson, particularly its refusal to produce consistent necks, and he awarded his endorsement to Heritage, which manufactured the Johnny Smith Rose per his original Gibson design. Johnny also played a significant part in the development of dedicated amplification for the instrument. In the late ’40s, amplifiers were unreliable and intended for general purpose rather than specifically for electric guitars. In the early ’50s, Smith was one of a handful of test pilots for Everett Hull’s Ampeg company. Their work together resulted in the production of some of the first dedicated and respectable guitar amps. However, Smith was never happy to rest on his laurels. He wanted an amplifier with flat frequency response, which would amplify his archtop without boosting its treble or bass frequencies. 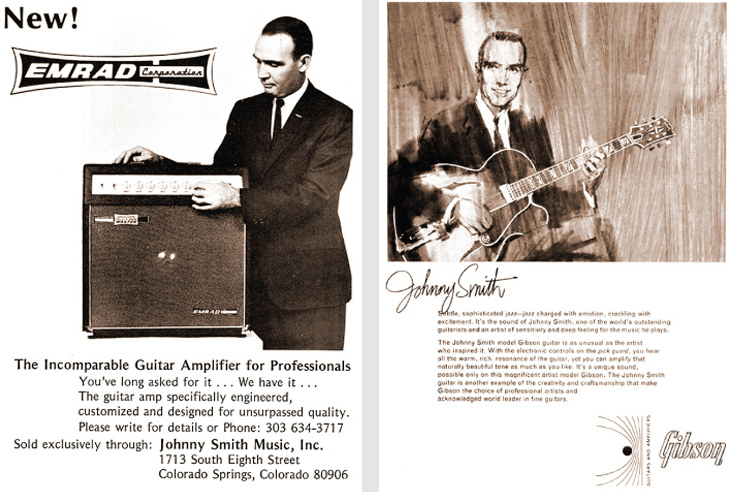 In 1955, the first Ampeg Johnny Smith model went into production. Two years later, the grandly titled Ampeg Fountain of Sound became available. The Fountain of Sound was, in effect, the Johnny Smith model fitted with four legs and turned on its back so the speaker faced upward. Virtually every studio guitarist in New York used it. 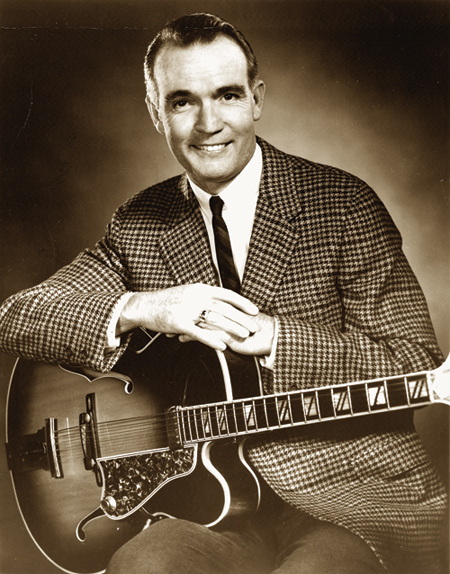 When Smith’s Gibson endorsement began in ’61, the company was eager to have him using one of its amps. Johnny was reluctant because Gibson didn’t produce a unit with a flat frequency response. So, in ’64 the manufacturer agreed to produce what would become the GA-75L Recording model, which can be heard on Smith’s three albums for Verve in ’67 and ’68. In the late ’60s, Smith sought to re-create the tube-driven Gibson amplifier in solidstate form with the EMRAD Johnny Smith model, which he used on his tour with Bing Crosby in 1976-’77. Most of Smith’s albums were on the Royal Roost label, which in 1958 was absorbed by Roulette, which was owned by the notorious Morris Levy. “I don’t know who bought my records – jazz fans, guitar players, or perhaps sophisticated New York types – but most of them were panned by the ‘experts’ like Leonard Feather,” Smith said. “Of course, a lot of them, I hoped, would remain buried (laughs)! I did two albums with big string sections for Roost. Arranging and writing for strings was my biggest thrill – my great love. 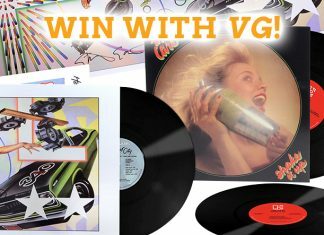 After that, I made three albums for Verve. The vast majority of jazz guitarists disagree vehemently with Smith’s assessment of his playing. Guild and Ampeg were happy to mark their partnerships with Smith by placing ads touting Smith’s recognition by Downbeat magazine. All of the players queried concede Smith was a comprehensive player capable of delivering whatever a session needed, and was indeed a jazz guitarist of the first magnitude. 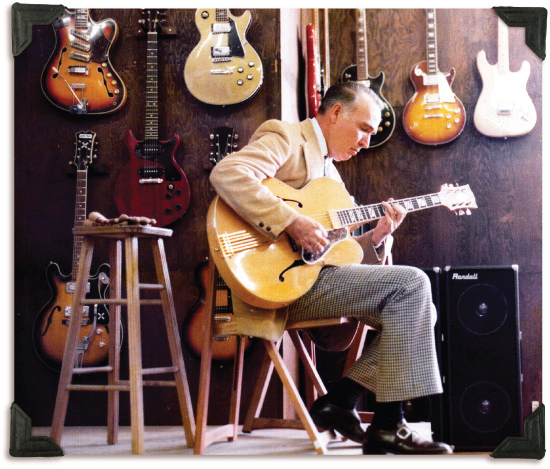 For someone so identified with archtop guitars, Smith had a checkered, often unfortunate, history with his instruments. When he got the letter in Portland to report to NBC, his Gibson L-5 had been stolen from a check room. So he arrived in New York with no guitar. He met Harry Volpe, a guitarist on staff at Radio City Music Hall who also owned a music store. Smith’s strings were unique, as well. The Gibson Sonomatic JS set came with a flatwound low E because he so often used a drop-D tuning. In addition to “Moonlight in Vermont,” Smith’s other big hit was composed while he was trying to find a counterpoint melody for the jazz standard “Softly, As In a Morning Sunrise.” This time, his hit was an original, and the manifestation of his counterpoint search was “Walk, Don’t Run,” which reached the Top 10 on Billboard twice in the early ’60s. The story behind the tune has its moments. But there’s more! Jim Stafford, who charted a couple of pop hits in the ’70s, was a close friend of Atkins, and he told Stafford that while playing his version of “Walk, Don’t Run” at the Birdland that night, Smith corrected him on a few notes. “When Chet shared that story, he had a hint of rancor in his voice because he wasn’t used to being corrected, even by the great Johnny Smith,” recalled Stafford. Today, Stafford, a superb guitar soloist who appeared onstage with both Atkins and Smith, still incorporates passages in his arrangements as a result of studying Smith’s book, Aids to Technique. “I spent hours with that book as a teenager, and its exercises have informed my playing to the extent of their truly becoming ingrained,” he said. Another interesting controversy in Smith’s career was a letter he wrote to classical guitarist John Williams. Of course the irony is that later in Williams’ career, he experimented with electric guitar and sound processors as a member of the rock-fusion group Skye, and with Pete Townshend – with whom he recorded a version of the Who’s “Won’t Get Fooled Again” for Amnesty International’s benefit show The Secret Policeman’s Ball. A press releases from the time said Williams wanted the broader attention of the rock audience. Smith’s final tour was with Bing Crosby in 1977. “I hated the travel and trauma of trying to get on airplanes with a guitar and amplifier,” he said of attitude by that point. “Bing died a few days after the tour finished, and I decided then that I didn’t want to do it anymore. Special thanks to Lin Flanagan and Mitch Holder for their invaluable contributions to this profile.